To do our little part to make sure kids all over the country have an equal shot at a good education, Story House gives 10% of its profits to DonorsChoose.org. We thought you might want to read more about the latest two projects we've funded. One of the reasons we chose this project was because I lived in Mississippi for a pretty long time. 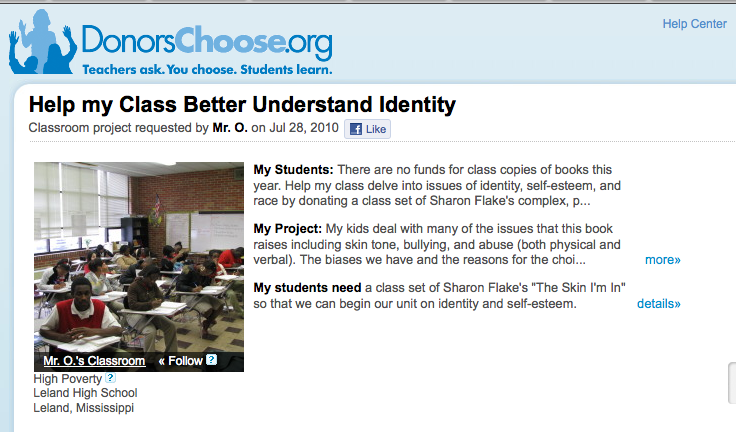 I also loved that the teacher was using literature to teach such tricky/sticky issues like identity and self-esteem. Oh, if only I had had a teacher like Mrs. L—I might not be so petrified of speaking in front of a group lo these many years later. If you happen to have any "pet projects" on DonorsChoose, let us know and we'll add them to our list!